The Planted Trees: Freaky Friday: Crabtastic! I know last time I talked about an animal, and this time I'm going to talk about an animal that is my pet. He is Hermie the hermit crab. There is one thing that he likes to do better than crawling up my hand is climbing up his wall. Now I am going to talk about what I have learned about hermit crabs. 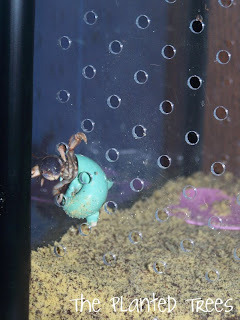 The thing that I was most interested in about hermit crabs is their habitat. A hermit crab needs a salt water dish, a fresh water dish, and a food bowl. They like to have other hermit crabs with them because they are social animals. That is why Magpie is getting a hermit crab named Sebastian. Did you know that hermit crabs are nocturnal? That means that they are awake at night.